Workers use heavy equipment Monday to work on expanded parking off Fenner Lane at Highland District Hospital. Highland District Hospital has begun the first phase of a $23 million project that will expand the hospital’s current footprint by more than 39,000 square feet, renovating the existing space and increasing the parking lot capacity, hospital officials said. HDH Vice President of Operations Tim Parry said the first phase “involves a lot of preparation and coordination,” and customers should be aware that some entrances will be closed while others remain open. During the first phase of the project, patients and visitors are encouraged to park and enter the building on the front side of the campus at the main patient entrance, according to the release. Phase 1 includes the construction of fencing, gates and work stations, and site work will begin preparing the campus for the months ahead, according to the release. 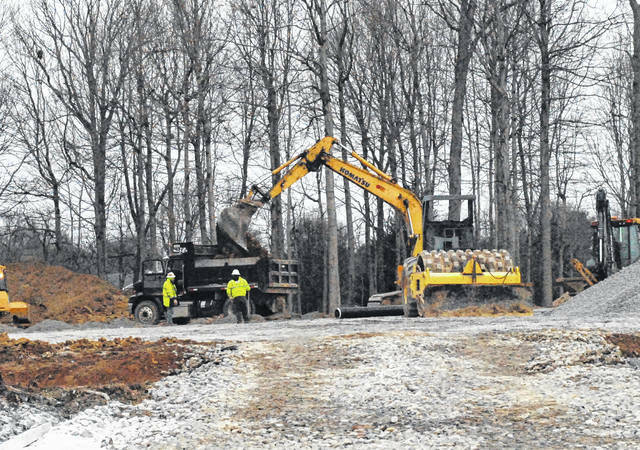 Building materials will start to be delivered and stored onsite, and the back parking area will start expanding now that trees have been cleared from the area, the release said. As previously reported, Highland District Hospital announced the expansion in August. HDH Marketing Manager Ashlee Cheesbro told The Times-Gazette that the project, which will unfold through three phases, is expected to be complete in the summer of 2020. The project includes the addition of all private inpatient rooms equipped with the newest technology, a separate orthopedic and sports medicine outpatient clinic, on-site and expanded outpatient rehabilitation, additional patient registration access points, a new cancer care unit, an expanded and remodeled surgery unit, and a more easily accessible patient entrance with improved traffic access, including a parking lot expansion, the hospital said in a news release. This will be the hospital’s sixth extensive project — from the complete new build in 1962 to several expansions and renovations throughout its history — according to a news release. The project will be completed in partnership with Pepper Construction of Ohio, design firm TEG Architects, and in collaboration with Megen Construction, according to the hospital. The hospital said further updates will be available on the HDH Facebook page and the HDH website, www.hdh.org. Highland District Hospital is a critical access designated, 25-bed acute care facility that employs more than 350 people and benefits from the services of more than 50 community volunteers. The medical staff includes more than 100 physicians and mid-level providers, representing more than 25 specialties and subspecialties. Highland District Hospital is a community-centered hospital that serves Highland and the surrounding counties, and is known for its state-of-the-art technology and innovative health care services, according to the news release. Reach David Wright at 937-402-2570.